This slow-cooker dish is so easy to make and so delicious. If you don’t have Spicy Caribbean Barbecue Sauce in the fridge (or don’t have time to make it), you can substitute any store-bought brand of low-sugar barbecue sauce. In a nonstick skillet, heat the oil over medium-high heat. Quickly brown the pork and transfer it to a slow cooker. Add the onion and carrot to the skillet and cook for about 5 minutes, or until soft and just starting to brown. Add the garlic and cook for 1 minute longer. Add the beer and 1 cup barbecue sauce and bring just to a boil. Remove from the heat and pour over the pork. Cover the slow cooker and cook on high for about 3 hours. The pork will be very tender and will separate easily with a fork. Wrap the tortillas in foil and warm in the oven at a low temperature for about 15 minutes. 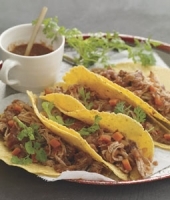 Serve the pork in the warm tortillas garnished with cilantro and extra barbecue sauce if desired. Source: Flavor First by Cheryl Forberg. By permission of Rodale, Inc. Available wherever books are sold. How many tacos to a serving?